Imagine putting together a really healthy meal - organic / slow cooked / lots of love / maybe raw / maybe something special for a particular friend / no soy / all good fats... and THEN the spoiler! BAD SALT! We tend to define salt by colour: Pink Salts vs. Greyish Sea Salts vs. White Salt From-A-Box. ALL salts from where-ever they were mined, before we refined / processed / tortured them, packed a powerful punch. There can be up to 80 trace minerals and elements found in some salts and less in others (sulphates, magnesium, calcium, potassium, sodium, chloride, borate, strontium and iodine and many trace minerals). So why all the fuss about which salt is better? It’s in the processing! Extremely high heat processing (much higher temperatures than ordinary cooking temperatures), is the biggest culprit in regards to decreasing the healthfulness of salt (any salt from anywhere and any colour! Very high temperatures cause the two minerals that make up salt – the molecules of sodium and chloride - to bond VERY strongly and unnaturally. Sodium and chloride - which are so very essential for us to have in our bodies – separately - are restructured by high heat processing - to become a bonded two-some type molecule that cannot be re-separated again during digestion and therefore become useless to our bodies. The heat-bonded sodium-chloride molecules are seen by our bodies as toxic and indigestible! In healthy people all toxins that end up in the digestive tract are enveloped with mucous immediately made by the intestinal lining in order to mitigate damage and take the toxin out of harm;s way - this then could end up just stuck in the gut or eventually be eliminated - and over time this can / does accumulate making our intestines unnecessarily burdened (as if there isn’t enough burden there already). This applies to the very finest purest pink crystals (if they have been heat te=reated), down to salt from a poor quality lake bed – no matter from where the salt hails. ALL high heat processes alters the molecular bond - distorting it. Neither Health Canada nor the FDA requires disclosure of this processing manner (surprise!) on salt packages. HIMALAYAN (pink): This pink salt comes from ancient salt sea-beds left behind high in the mountains, and is rich in varying mineral content. And the salt-in-a-box (of olden days) also comes from a body of evaporated water - probably also an ancient inland sea-bed. So all salt comes from a salted body of water, namely, an ocean or a salt-water lake. However, Himalayan salt is said to be of the purest form. The Himalayan mountain ranges stretch across China, Nepal, Myanmar, Pakistan, Bhutan, Afghanistan, and India. Their crystallized sea salt beds, now deep within these Himalayan mountains, are in a pristine environment protecting the salt from modern-day pollution leading to the belief that Himalayan Pink salt is the purest salt to be found on earth. So, when buying small pink Himalayan crystals, in a nice little package in a proper health store, one must believe or be sure that there has been no heat treatment applied to these crystals - as often (or never) the packaging doesn't specify. OTHER SPECIAL SALTS (sometimes pink and sometimes grey): Salts from the Dead Sea or Brittany or other lakes and shores around the world are scoped up and may have experienced processing with high heat in order to cleanse the salt (swimmers, rusty objects and boats abound on the Dead Sea; open air pollution and chemtrails decend over Utah's lakes; as well as the ocean's pollution on the shores of Brittany, etc, as examples). These salts are all high-heat treated - for health reasons. Yet some of these salts are highly prized, high priced and promoted as extra healthy! Just because they are not marketed in grandma's cardboaard box with a little metal lip, doesn't make them awesome! The question is: ...are they heat-processed? Commercially refined salt is not only stripped of all its trace minerals, it is also chemically cleaned, bleached and heated to unnecessary high temperatures. Then anti-caking agents which prevent salt from mixing with moist air in the box are added. (Under US law, up to 2% of table salt is allowed to be made of additives; can do no harm??? Really???). Finally, the iodine that is added to salt for our health is usually synthetic which is difficult for our bodies to process properly, so that advertising claim is worth babbkes. However, the natural iodine in rock salt is indispensable! So, we can just walk around all this confusion by using the big balls of beautiful pink Himalayan salt - often sold as candle holders in health food stores (even at some drug store chains around Hallowe’en time). These beautiful balls have OBVIOUSLY NOT been tortured - neither with chemicals nor heat. Take the salt ball; place it in a pillow case or clean cloth bag that you don't mind torturing, and bang away with a hammer or mallet. The ball will break into smaller pieces. The large ones you can place into a wide-mouthed GLASS jar and add water (just to saturation). The brine you create will be perfectly healthy for adding to your cooking. The tiny salt pieces that splinter off from the pounding and dust can go into a salt grinder - for on the table. The grinder will take a toll as the salt is so hard! The saturated brine will taste beautifully - life giving! The replenishing nutrients can be picked up through the skin, too. Stimulate circulation, detoxify and soothe sore muscles by way of a very hot bath, 30 minutes and voila! Naturally rich in 80+ nourishing and skin-replenishing minerals, bathing with your pink Himalayan salt brine is brilliant; always make sure that the concentration of salts is higher in the tub water that you are surrounded by than the mineral concentration in your body - so that's upwards or four cups for a small tub - and can be up to seven depending on the size of the tub. (We are salty bodies! Just taste your tears!) This is not a place to skimp! You want the flow of minerals to be inward through your pores, rather than leeching minerals outward, which is what happens if you use just a little bit such as a cup. Another healing and therapeutic experience for mind and body is a combination of Himalayan salt and Epsom salts. Crystal rock lamps are sold for air purification and air ionization purposes in some health stores. Having this rock or candleholder around will make absolutely no difference to your air quality unless you have an entire wall of salt (in spite of the one-ball claims). But using that crystal rock in your kitchen for cooking is a huge asset. Crystal salt rooms for improved breathing have such a massive amount of rock salt that there certainly is a therapeutic difference for healing bronchial and lung tissue - a really good thing. Take a look at the Romanian salt mines below! 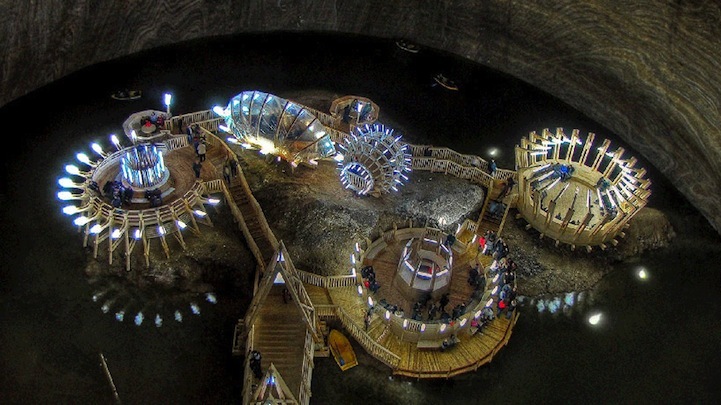 The old Salina Turda Salt Mines in Transylvania, is the world’s largest salt mine museum. Originally established in the 17th century, the massive mines were formed completely by hand and machine rather than by using explosives. And the Polish one at http://www.wieliczka-saltmine.com - a UNESCO designated World Heritage site – you will not find anything like it anywhere in the world salt with benefits!. https://youtu.be/WQxjcgTn9tw. Wieliczka is only a 20 minutes’ bus ride from Cracow so if you are there checking up on Da Vinci’s masterpiece, check Wieliczka salt mines out as well. Would you like the report 78 FoolProof Tips to Improve Your Health? Just send a return email with ‘78’ in the subject line. It's free.